The tree and all the ties will be burnt in a special ceremony on the 4th day after the completion of ceremony...Everyone is welcomed to attend. If you'd like to be notified of that date and time please ask to be emailed. It is your responsibility to bring your own cloth and string/yarn. 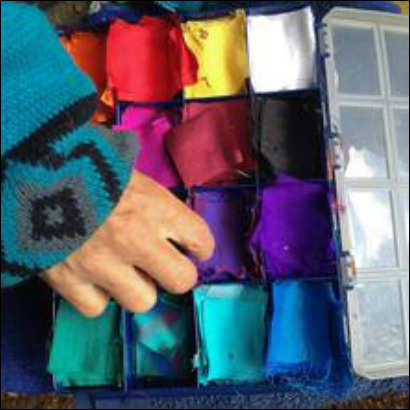 I find that usually a half yard of each of the four colors of ﻿red, yellow, black and white ﻿are sufficient, you can add the colors blue, green and purple...Also if you have been given your spirit colors bring cloth in those colors as well. Ties are made with tobacco so, remember to bring plenty. Here is a great idea for having your prayer tie stuff in one place and at the ready. All you need is a plastic box with dividers, they usually sell them very inexpensively in the hardware or fishing department. They will conveniently hold multiple colors of cloth squares roughly 2' x 2" , your scissors and string.